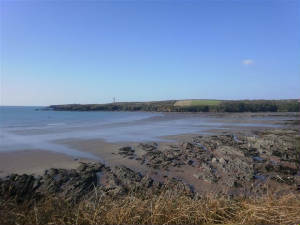 Sandy haven beach, a mile down the lane from the Taberna (20 minute walk or 5 minute drive to beach car park). This is a wonderful beach for the children to explore. The estuary is tidal, and at low tide stepping stones magically appear to take you to the other side. We are only three miles from Littlehaven and Broadhaven; Marloes, Dale and St Brides are all less than a twenty minute drive away. Just beyond Marloes is Martin’s Haven, the embarkation point for boats to Skomer to see the puffins and shearwaters. On the road from here to Milford , just a mile from the Taberna, you will find the Milford Haven golf course, with its spectacular views over the haven.